Several years ago I joined ongoing studies of Hawaii’s humpback population. One of our recent observations was that whale habitat choices in the Au’Au channel seem to be changing, and responding to their environment (Cartwright, Gillespie, et al., 2012). In those waters, the humpbacks seem to avoid regions of intense boat traffic, suggesting that they are sensitive human contact, especially boat-traffic. Do the Drake Bay humpbacks display similar habitat preferences? Do their choices vary over the breeding season? As well, in the Hawaiian population calf age has been correlated both to the furling of their dorsal fin and calf swim/rest behavior (Cartwright, et al., 2009). In the Au’Au channel, calves have been observed rest more as they mature, diving more often and deeper, and traveling less. We will determine whether these observables correlate similarly in Costa Rican waters. If these behaviors are stimulated by developmental changes in the calf, then similar behavioral profiles are expected, regardless of nursery area. Do calf dorsal furls correlate to breathing patterns in Drake Bay, as they do elsewhere? Fluke comparisons are a standard tool for monitoring movement of whales among feeding and breeding waters (Seton, et al., 2002. As efforts at understanding the California population of humpbacks grow, it is increasingly critical to map the nursery habitat usage of those animals. While observations linking animals in California and Drake Bay have been made (ref), no comprehensive effort has been made to collect and correlate fluke images from these regions. How many California whales can we map to Drake Bay? This project is being undertaken in conjunction with Fundación Keto, Costa Rica's premiere nonprofit dedicated to marine and costal resource management. We will leverage the skills and local experience of Keto's personnel, to ensure we work efficiently and with utmost respect for Costa Rican ecology, and ecological sciences. Humpback whale populations are recovering from the commercial whaling era of the 19th and 20th centuries. Though the North Pacific population is being considered for delisting from under the Endangered Species Act, their migration between habitats makes humpback management complex. Our work seeks to directly link monitoring efforts of the California group of whales to their nursery waters in Costa Rica. Building a fluke catalog of this population - both for our own research purposes and for inclusion in general monitoring efforts – is part of establishing migration and family histories for this sub-group of whales. As the Californian subpopulation continues to rebound, our studies will help provide baseline data and perhaps allow interpretation of changes in population/behavior over time. A map of whale distribution in their nursery waters means we can begin to understand what kinds of habitat humpbacks prefer. Do females with calves choose different spots that solitary whales or groups? It has been suggested that this is the case for some populations; our work will help show whether habitat selectivity is a general feature of humpback populations. As well, understanding the factors that govern humpback habitat choice may help us improve conservation efforts. We want to know exactly which whales are making their way to Drake Bay, so we’ll be taking high-quality photographs of whale flukes. By comparing these to flukes in existing catalogs, we will be able to identify these animals, and begin building a history of their travels. We will map the location of all our observations in the waters between Drake Bay and Isla Caño. Using a combination of systematic, transect-based surveys and opportunity-based sightings, we will observe how this population is distributed across the region. We will conduct focal follows to monitor the behavior of animals across all types of humpback social groups. We will correlate these observations with calf age, to determine whether behavioral patterns and developmental switches compare with humpbacks’ behavior in their Hawaiian nursery. Since we’ll be monitoring the population over an extended period (Feb-June), we can also observe how population, distribution, and behavior change over the whole breeding season. Getting on the water with the whales is the biggest barrier to getting the work done, so the entire budget of this project is dedicated to boat time. Since the work will be carried out during my sabbatical, during Spring semester 2014, the only funds required will be for hiring boats and captains in the town of Agujitas in Drake Bay, Costa Rica. Their local knowledge will be indispensable in locating and interacting with the whales, minimizing disturbance of the animals while maximizing our productive research time. These boats are usually hired to take groups of tourists for half-day whale-watching tours, so hiring them means taking them away from their normal business model. A typical half-day will cost $400-$500, boat and captain included. The project budget is expected to pay for at least 10 field days, though we hope to increase this to 15-20 days by contracting with 1-3 individuals by guaranteeing them substantial and consistent compensation for this period. All other equipment is already owned by the project personnel. These include professional photographic equipment, dry- and underwater high-definition videography equipment, navigation-enabled iPads for location and behavior data entry/mapping, GIS and statistical analysis software. 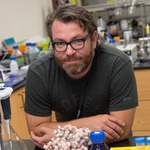 Blake Gillespie is a biochemist working at California State University Channel Islands. His training at the Institute for Molecular Biology and before that at The Evergreen State College means that he's an interdisciplinary scientist more focused problems than techniques. He began studying humpbacks in Hawaii in 2008, volunteering with local researchers. For the last several seasons, he has taken groups of undergraduate students from CSUCI to Maui for a weeklong field experience each spring. Jose David Palacios is a marine biologist with the Costa Rican NGO named Keto Foundation. He is a cetacean specialist, mainly focused on species sighted in Costa Rica, including Humpback whales. He has been working with these whales since 2004 in the south Pacific of CR, taking data about photo-identification, behavior, distribution, interactions with boats, etc. He has actively participated in government-led conservation studies aimed at the the creation of new Protected Marine Areas.